Scratch the wreath from a Starbuck’s cup design and you get an uproar: they’re defiling religion and steamrolling Christianity into oblivion! As usual, the silent majority is loud enough to drown out the opposing viewpoint — that the ever-expanding commercializing and mythologizing of Christmas is numbingly repetitive and downright offensive to those of us who believe differently. A few of us don’t welcome the sound of jingling bells and jolly Santas from mid-October through late December. And some of “us” could be Christians. Long, long ago, it was past time to push back. So, it’s nice to hear that freedom of religion isn’t a mere shibboleth at Children’s Theatre of Charlotte. Not only are they daring to program a non-Christmas show at one of their two theaters at ImaginOn this December, they’re revamping the remaining Christmas show so it yields space to Chanukah and Kwanzaa. As daring as this undertaking is, it’s even more ambitious. The non-Christmas show is Ella’s Big Chance: A Jazz Age Cinderella, and the Yuletide offering is ‘Twas the Night Before. Both of these productions are spanking-new world premieres, both commissioned by Children’s Theatre. On top of that, Ella is also a musical. Adapted from Shirley Hughes’ children’s book by Joan Cushing, Ella is a formidable project all by itself. So, the first question I needed to ask artistic director Adam Burke, who’s directing Ella, was when did you lose your mind, shepherding two premieres to ImaginOn at the same time? But that struck me as a bit hostile, so I bumped it down to my second question. “I’m surprised that you are the first person to ask me that!” Burke confessed. One thing that has made this double-plunge feasible is the confidence that Children’s Theatre has in Cushing, who previously premiered a new musical, A Christmas Doll, back in 2007, before Burke arrived in Charlotte. Besides that piece, numerous other Cushing musicals have enjoyed success at ImaginOn, including Junie B. Jones and the wickedest Red Riding Hood adaptation you’ll ever see, the Cajun-spiced Petite Rouge. Make no mistake, Ella Cinders is a thoroughly modern Cinderella. 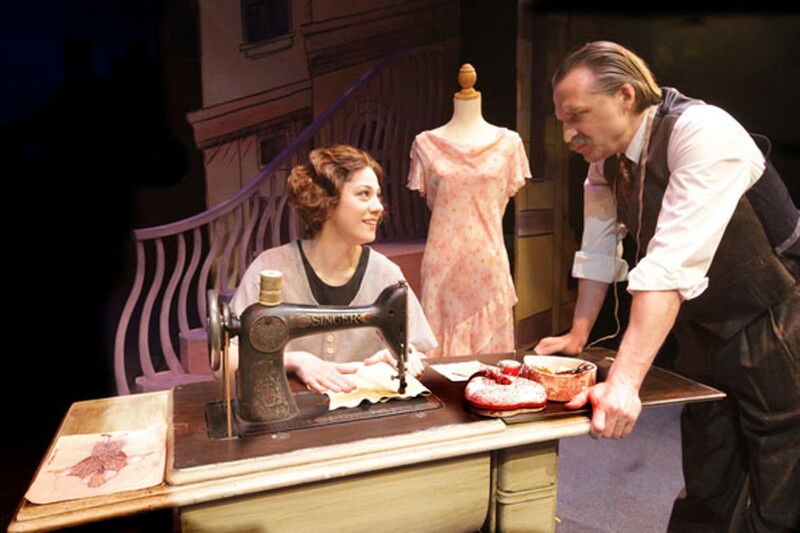 She’s a London dressmaker serving her apprenticeship in her father’s shop during the Jazz Age, the Roaring Twenties. To their credit, Ella’s new stepmom and stepsisters turn Dad’s humble shop into a fashion hotspot — leaning heavily on our heroine’s toil. Do not think of them as clones of Carly Fiorina. The focus remains primarily on Ella. Besides the opportunity to collaborate with Cushing, a prime attraction of this jazzy Cinderella was its feminist thrust. It may also be possible for a wonder-working godmother to be a picture of elegance rather than a bumbling Disney biddy babbling “Bibbidi-Bobbidi-Boo.” Burke promises that Ella will be jazzy. Providing a hip fairytale alternative to Christmas fare is certainly welcome, but the sharper edge of this two-pronged overhaul of December programming is ‘Twas the Night Before, written and directed by April Jones. A commanding force on the local scene before leaving Charlotte in 2005 to care for her father and grandmother up in Buffalo, New York, Jones won eight of the Loaf‘s most prestigious Theatre Awards over a three-year span. These included a Director of the Year and Theaterperson of the Year double in 2000 and again in 2002, when she also won Best Original Play honors. Nearly all of Jones’s award-winning exploits were at Children’s Theatre in its pre-ImaginOn days on Morehead Street. She acted in Ramona Quimby when it won Show of the Year honors in 1997 and directed Boundless Grace when it took the prize in 2000. Jones has been back in Charlotte for just over a year, currently a visiting lecturer on acting at UNC Charlotte. Burke also teaches at UNC Charlotte, and in conjunction with his Theatre for Young Audiences class, has brought a couple of Children’s Theatre plays to the university for development, calling upon actors in the theatre department for help. With Jones stationed in the same department, Burke was able to bring ‘Twas the Night to his class with the playwright close at hand. Writing for a young audience, with just the four actors of Children’s Theatre’s Resident Touring Company at her disposal, Jones found it challenging to shape a simple and meaningful tale that freshly embraces three different traditions. Respecting and understanding the less-familiar holidays was also fundamental. Paradoxically, Jones struggled most with Christmas, the most familiar holiday. If you skirt the Nativity, you’re missing the essence of the holiday, yet the story has been told over and over — to the point that you’re repeating, not really telling anything. Research didn’t help here. Creativity took over, leading Jones to a new theme. Call it secularism or diversity, these bold Children’s Theatre initiatives aren’t the impulses of a few rogue artists.